There are many specialty license plates available in the state of Tennessee which people use them to show their support for various causes or to show their status as a veteran for example. Specialty plates cost an extra $35.00 each year in Tennessee. The money collected from the additional costs of these plates goes towards each of the causes represented on them. Each plate must have enough interest and support represented in their purchases to remain available though. In 2016, Mothers Against Drunk Driving (MADD) Tennessee lost their specialty license plates after drivers failed to purchase the required minimum number to keep the plates in circulation. However, Senator Paul Bailey has granted MADD Tennessee another chance. If MADD can pre-sell 1000 plates before June 30, 2019, the design will be back in circulation. It is a daunting challenge, but more is at stake than just a decorative license plate. “Our plates serve as rolling billboards to bring awareness to the issue drunk and/or drugged driving, and what better place to have a message regarding highway safety?” said Norris Skelley, MADD Tennessee State Board member. Not only do these license plates raise awareness, but the proceeds MADD receives from each plate helps fund their Victim Services Program–which provides help to those that have been affected by impaired driving–at no cost to the victims and their families. It is a critical source of funding that was lost when the plates were discontinued. Anyone interested in pre-ordering a MADD plate should visit tnmaddplates.com and sign up. When the minimum of 1,000 pre-orders has been reached, then the $35.00 per plate will be due. While there is currently no Johnson County Chapter of MADD, several locals have been working on starting one for quite some time, but have not gotten the needed support to do so. Jeanie Linton, the mother of Jadey Dunn who was tragically killed by a drunk driver in Mountain City 20 years ago, has been trying since then to start a local chapter for Johnson County. For more information regarding MADD Tennessee specialty license plates, contact Norris Skelley at norrisskelley@gmail.com or 931-261-4168. For more information about starting a Johnson County MADD chapter, please contact the Tennessee State Office at tn.state@madd.org or 615-360-8055. One of the defendants following the incident on December 28, 2018, where a victim in the Cold Springs community had her home broken into by two individuals and was locked in a room of her house, has pled guilty. According to law enforcement officials, Willie Davis, 41 of Bristol Tennessee, pled guilty in Johnson County Criminal Court on Friday, March 29, 2019. Not mincing any words, Judge Lisa Rice sentenced Davis to 20 years to be served at 100 percent. The incident was investigated by Johnson County Investigators, assisted by the Sullivan County Sheriff’s Office. Initial reports stated that two suspects including Willie Davis and Jennifer Jenkins, 42, of Sullivan County were involved in an armed robbery and aggravated kidnapping in Johnson County, which ended after a pursuit, assisted by deputies from Sullivan County. Davis and Jenkins were apprehended on January 1, 2019. With more charges pending, Davis and Jenkins were arraigned on Wednesday morning, January 2, 2019, in Johnson County. Davis and Jenkins were charged with conspiracy to commit aggravated robbery, aggravated robbery, and false reporting. New status report reveals 24.4 percent increase in suicide deaths among children ages 10-17. 24.4 percent from 2016 to 2017; and more alarmingly, suicide by children increased by 54.5 percent from 2015 to 2017.
deaths in Tennessee in 2017, up from 1,110 the previous year. The suicide rate increased from 16.7 to 17.3 per 100,000. Suicide was the tenth leading cause of death in Tennessee during 2014 – 2016. The “2019 Status of Suicide in Tennessee” report provides state legislators, mental health professionals, and the general public with information on the problem of suicide in our state and what is being done to prevent it. Each year’s edition includes a detailed report on suicide trends within Tennessee, both overall and by age, race, gender, and geography. The complete report is available on the TSPN website at http://tspn.org/wp-content/uploads/2019/01/TSPN-Status-of-Suicide-2019.pdf. As TSPN staff, its many volunteers, and the innumerable suicide prevention advocates across the state know, Tennessee is a national model with our efforts for suicide prevention. With that said, we must, as a state, increase our efforts to combat this public health crisis. For every number and rate that is provided in the “2019 Status of Suicide in Tennessee” report, a family member, loved one, neighbor, co-worker, and friend suffers an unimaginable loss. To learn how to get involved with TSPN or to request a suicide prevention training visit our website, http://tspn.org/. The order establishes Tennessee Criminal Justice Investment Task Force. Tennessee Governor Bill Lee issued an executive order last month to establish the Tennessee Criminal Justice Investment Task Force as promised during his State of the State address on Monday evening. According to a release from the Governor’s office, the sixth executive order issued under his leadership comes after he outlined comprehensive plans to address public safety in Tennessee amid higher rates of violent crime and recidivism. Lee’s office stated that the incarcerated population of Tennessee has grown by 34 percent since 2000, despite six consecutive years of reduced admissions to the criminal justice system. The task force will be chaired with appointments including crime victims and their families, members of the General Assembly, state agencies, law enforcement, community and faith-based programs, and formerly incarcerated individuals by former judge Brandon Gibson of Crockett County. Lee has proposed measures to crack down on fentanyl traffickers, increase pay for corrections officers and law enforcement, reduce expungement fees and increase educational opportunities for incarcerated individuals. The Scam: Citizens are being advised that the call is from Mountain Electric Co-op and that their meter is expiring. Citizens are then be directed to go to Stores such as Rite Aid to purchase phone cards and to call them back with the numbers from the cards. Failing to do so will result in a disruption of their service. These calls, which appear to come from a local phone number, are not legit. Mountain Electric will never ask you to purchase any type of card, that will have anything to do with your service. If you should receive any kind of call representing Mountain Electric that you are unsure of, please call the local office to confirm. If still suspicious, please notify the Sheriff’s Office as well. The Tennessee Highway Safety Office (THSO) a division of the Tennessee Department of Safety and Homeland Security advocating for traffic safety was pleased to announce in a release last week a significant increase in the state’s overall seat belt usage rate, compared to previous years. According to THSO officials, the usage rate rose from 88.5 percent in 2017 to 90.9 percent in 2018, which they said marks the first year Tennessee’s usage rate surpassed 90 percent. Tennessee’s 2018 usage rate also exceeded the national usage rate of 90.1 percent, the release said. Highlights from Tennessee’s 2018 seat belt survey are as follows. • Research data was collected at 190 pre-identified roadway locations across the State of Tennessee. • Researchers observed more than 27,000 front-seat vehicle occupants. • Vehicles observed included cars, pickup trucks, vans, and SUVs. • Overall, female occupants displayed a higher usage rate (94.8 percent) than males (88.3 percent). • Pickup trucks displayed the lowest usage rate (84.24 percent). The above data was collected through an annual roadside observational survey conducted by the University of Tennessee Knoxville’s Center for Transportation Research. Tennessee’s seat belt usage rate is certified by the National Highway Traffic Safety Administration. THSO’s mission is to effectively develop, implement, and evaluate these programs. To learn more, please visit www.tntrafficsafety.org. For more information, please contact Arriale Tabson at 615-767-3242 or arriale.tabson@tn.gov. A.C.T.I.O.N Coalition, a local organization that works to create a positive environment for young people by providing positive youth development activities, will be hosting its first evening Community ACTION meeting. The event is scheduled for Tuesday, March 26, will be the first quarterly evening community meeting, at the First Christian Church Life Center from 6-8p.m to provide the community with information. “Our goal is to get more parents and students and community members involved in the work of the coalition and to gain their insight and input as to how we can best serve our community needs in regard to Substance Use Disorders (SUD) and the ongoing fight against the opioids crisis in our region,” said A.C.T.I.O.N Coalition, Executive Director Trish Burchette. The Rural Opioids Response Program grantees from Ballad Heath are partnering with ACTION for this first meeting, which is said to begin by providing some general information about how ACTION, located at 138 East Main Street in Mountain City, TN is working in the community at this time and the services we are offering for Johnson County. “This is a great opportunity for the community to meet with the Rural Communities Opioids Response Program grantees as they seek input from our community as to how this grant funding could help as outlined below,” Burchette said. Attendees will enjoy some refreshments, and we will have time for questions and concerns to address. The Rural Communities Opioids Response Program grantees are promising a well-rounded discussion during its portion of the informative meeting for the entire community with the goal of accomplishing a number of main objectives. 1. Gain community input on the opioids crisis and identify opportunities and gaps in Opioids Use Disorder (OUD) prevention, treatment (including Medication Assisted Treatment, MAT), and or recovery workforce, services, and access to care. 2. Use the information gained from these meetings to determine what existing federal, state, and local Opioids Use Disorder (OUD) resources could be leveraged within the rural community along with what new ones should be evaluated in the strategic planning process. 3. Overview of the project, a summary of why community input is being sought, education on some statistics of the opioids problem in this area, and education concerning common myths around Opioids Use Disorder (OUD). All community members who are interested in the opioids epidemic are urged to attend. For more information, please visit www.actioncoalition.org. Johnson County’s bullet and stab protective vest recipient, Rico and his Handler, T.J. Brown pose for a photo in Mountain City. Rico received the protective gear from Vested Interest in K9s, Inc. a 501c(3) charity organization located in East Taunton, MA. 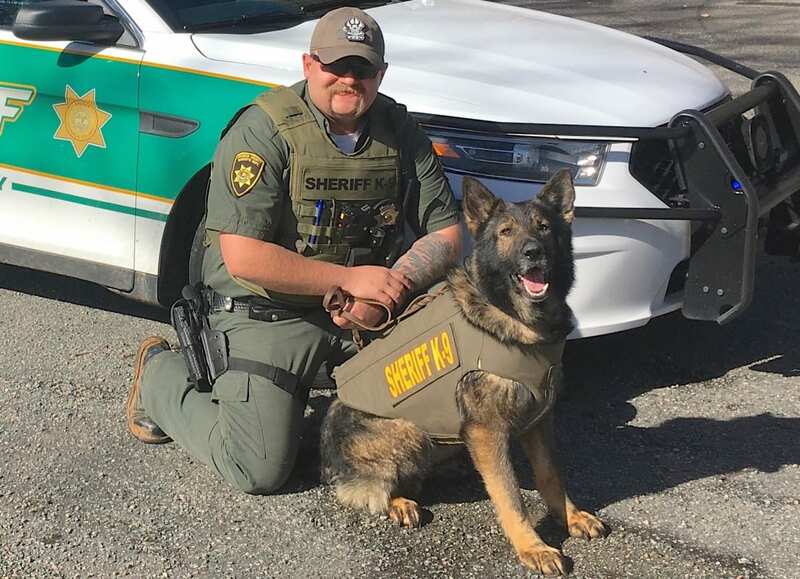 The vest was donated to the Johnson County Sheriff’s Office in memory of K9 Josey of the Union County Sheriff’s Office, TN.” Submitted photo. Johnson County Sheriff’s Office K9 Rico and his deputy handler JCSO Deputy T.J. Brown is ready to face the next chase, thanks to a brand new addition to Rico’s protective gear. With respect and honor of K9 units across the nation, the vest is embroidered with the sentiment, “In memory of K9 Josey, Union County Sheriff’s Office, TN”. “I am very grateful for the donation and appreciate what Vested Interest is doing for our K9 deputy-partners,” Brown said. As referenced by Brown, such armor is by no means cheap and for a good reason as it saves lives. That is a K9 officer’s lives. There is an estimated 30,000-law enforcement K9s throughout the United States. The donation to provide one protective vest for law enforcement K9 is $950.00. Each vest reportedly has a value between $1,744 – $2,283, and a five-year warranty and an average weight of 4-5 lbs. “K9s are trained to wear harnesses so this vest does not hinder Rico to get the job done,” Brown said. Vested Interest in K9s, Inc’s mission is to provide bullet and stab protective vests and other assistance to dogs of law enforcement and related agencies throughout the United States. The non-profit was established in 2009 to assist law enforcement agencies with this potentially lifesaving body armor for their four-legged K9 officers. Since its inception, Vested Interest in K9s, Inc., provided more than 3,300 protective vests in 50 states, through private and corporate donations, at a value of $5.7 million. The program is open to dogs actively employed in the U.S. with law enforcement or related agencies who are certified and at least 20 months of age. New K9 graduates, as well as K9s with expired vests, are eligible to participate. “Our K9 team here at Johnson County continues to work very hard to keep our community safe and protected as they are a huge asset to the department,” said Johnson County Sheriff, Eddie Tester. For more information or to learn about volunteer opportunities, please call 508-824-6978. Vested Interest in K9s, Inc., provides information, lists events, and accepts tax-deductible donations of any denomination at www.vik9s.org or mailed to P.O. Box 9 East Taunton, MA 02718. The Mountain City Town Council plans to review a package store ordinance draft during a special called work session Feb 26. City Attorney George Wright delivered a draft of an alcoholic beverage ordinance to City Recorder Sheila Shaw last week for the council’s consideration. Items contained within the proposed ordinance include liquor store licensing, fees, store locations, store size, signage, record keeping, enforcement, and penalties. The liquor store referendum passed on Nov. 6, with 3,183 or 54.27 percent of the votes cast in support of the referendum and 2,628 or 45.21 percent of the votes cast in opposition. The Johnson County Sherriff’s Department in collaboration with Tennessee Alcoholic Beverage Commission and the A.C.T.I.O.N Coalition Inc., conducted alcohol compliance checks among seven businesses licensed to sell alcoholic beverages in the region. Compliance checks of licensed establishments are conducted on a regular basis. To prevent underage sales of alcoholic beverages, TABC law enforcement agents use minor decoys who attempt to purchase alcohol from TABC licensed establishments including restaurants, bars, liquor stores, and retail stores. Minor compliance checks are an integral part of protecting our youth against underage drinking by ensuring that licensed establishments comply with the state laws against sales of alcohol to minors. ACTION Coalition would like to commend local businesses including Big Louis’, Doe Valley Food Mart, Dollar General (Butler) who demonstrated responsible alcohol sales during the recent compliance checks. Statistics have shown that compliance checks help to reduce the percentages on non-compliant retailers statewide. According to the Tennessee Alcoholic Beverage Commission, 1663 compliance checks in 2015 showed a 22 percent non-compliance rate, while in 2018 the 1696 compliance checks showed a drop to a 13 percent non-compliance rate. The Tennessee Highway safety commission awarded a $125,000 grant to the Tennessee Alcoholic Beverage Commission in December 2018 to prevent traffic-related deaths and injuries by addressing the illegal sale of alcohol to minors (under 21 years of age). TABC will use grant funds to deploy law enforcement personnel to areas of the state that have experienced a significant number of DUI related arrests and collisions. It will also assign agents to work at high profile events such as festivals, sporting events, and concerts. Selling alcohol to a minor not only affects the minor and the clerk but also the business. The Sheriff’s Department and Tennessee Alcoholic Beverage Commission initiated citations to one business notifying them of failing to comply with TN laws regarding the sale of alcohol to minors. Retailers who sell to an underage buyer are referred to the Johnson County Beer Board for failing to comply with the state’s alcohol laws. Responsible Beverage Server Training is available through the A.C.T.I.O.N Coalition to any outlet or individual that serves or sells alcohol. The five-hour training goes into depth about behavior cues and intoxication rate factors of intoxication, Dram Shop Liability, and Common Negligence laws, B.A.C, tolerance, alcohol proof amounts, and proper ID checking. Responsible Beverage Server Training can also reduce insurance costs for the outlet and possibility reduces fines imposed through the courts. 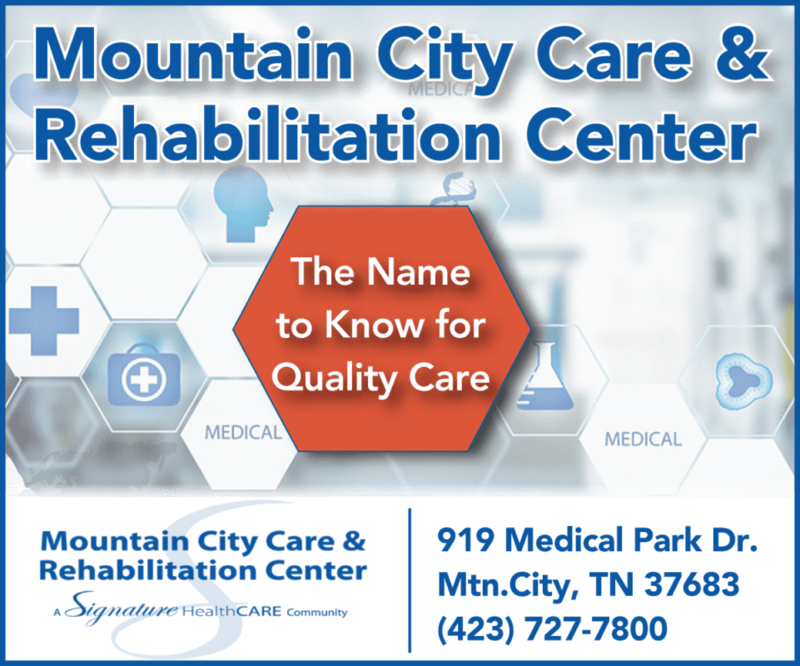 For more information, please call 423-727-0780. Denise Woods is the Prevention Coordinator at A.C.T.I.O.N Coalition, Inc. in Mountain City. The Tomahawk is distributed throughout upper East Tennessee, Western North Carolina and Southwest Virginia. We print over 3,700 copies weekly on Wednesdays. The Tomahawk, 118 S. Church St., Mountain City, TN 37683, 423-727-6121.